Almost 40 members and guests of Warrington Lodge of Concord No 1250, visited Warrington Masonic Hall to celebrate with Leslie (Les) Martin Smallman, 60 years in Freemasonry. 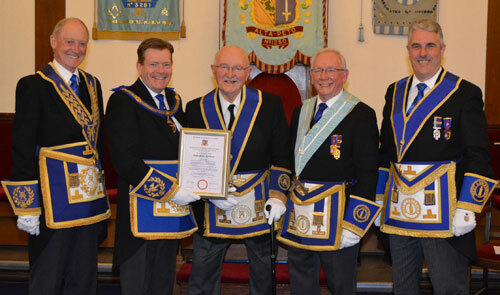 The principal guest on this special occasion was Assistant Provincial Grand Master Kevin Poynton, accompanied by Barry Jameson, Warrington Group Chairman Andy Barton and acting Provincial grand officers including Mark Barton, Les and Howard Savage. Kevin Poynton (left) and Les Smallman. The lodge was opened in due form by the WM John McIntyre, (Warrington Group Secretary) and the usual administration was undertaken. Shortly afterwards, when the lodge was still in the first degree, Mark Barton announced that Kevin Poynton, Assistant Provincial Grand Master, was without and demanded admission. Kevin was then admitted in due ceremonial style. John welcomed all present saying it was a great honour and privilege to welcome Kevin, the acting Provincial grand officers and Andy Barton. He continued by saying he hoped everyone would have an enjoyable evening. 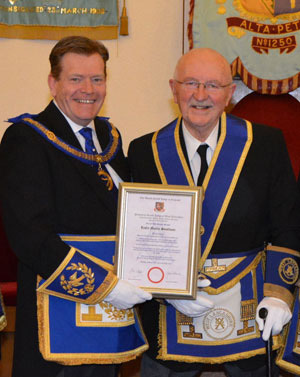 Kevin thanked John and the brethren of the lodge for their very warm welcome and commented that he felt privileged and honoured to witness the celebration of such a long-standing member of the Craft. Kevin continued by bringing the sincere good wishes of Tony Harrison the Provincial Grand Master. John, as a matter of procedure and as a mark of respect, offered Kevin the gavel, which on this occasion he was delighted to accept and occupied the chair. Kevin thanked John for his invitation and for allowing him to take part in the evening’s proceedings. He continued by saying: “Brethren, the exclusive Masonic 60’s club has now increased its membership by one. Now you may think that’s not much of an increase, but from my point of view it’s quite a significant number. The number one is in fact the first pioneering number. It’s synonymous with being the best! It’s the smallest whole number needed to tip the balance of two equal numbers. It’s also a number, although small, that can make a difference between happiness and misery. Brethren, I was delighted to be able to read through the notes relating to this evenings celebration which were very kindly supplied by your secretary and what particularly caught my attention was the fact, had it not been for single individuals coming together to act as a collective this evening would never have happened.” Kevin continued by saying: “So with your permission worshipful master and brethren I would now like to take you upon a brief journey through the life and times of our most recent addition to the 60’s club and I hope you will enjoy the celebration”. Kevin asked Mark to place Les Smallman, Past Provincial Assistant Grand Director of Ceremonies of the Province of West Lancashire on the floor of the lodge and ensure he was comfortable. Interestingly, one of the ships that they owned was named the ‘Hawarden Bridge’ and she had an interesting history. It was the first ship to enter Dunkirk Harbour after the liberation of the town during the war. After returning to duties on the river Dee, she was sold to a Barbados company in 1967. 11 years later she was found abandoned and adrift – her crew lost and engine flooded – a victim of the ‘Bermuda Triangle’. She was towed to Miami; the fate of her crew remains a mystery to this day. In 1930 the steel works employed a workforce of 6,000 men, but by 24 April 1931, – known to the people of Shotton as ‘Black Friday’ and without any notice, the workforce was slashed and 4,000 men were put out of work in one day. Later on, the company was to produce all of the corrugated sheet materials for the building of the famous Anderson air raid shelters, some of which still survive to this day. Fortunately, Les’ father wasn’t one of those 4,000, but still he had to suffer the effects of the dramatic fluctuation, probably never knowing if it would be his turn next. However, 1939 saw the dark clouds of war looming and Les’ father, still unsure about the future of the steel mill, was probably also concerned about working there whilst we were going to be at war. So, in 1942 he became the landlord of the Ship Inn at Connah’s Quay. It was probably a great idea, as the steel works was probably just as great a target as the Liverpool docks just down the coast, as the Germans had to disrupt our way of life at all costs if they were to force us into surrender. Les has memories that you will never forget. The first being early in the war, when one day very early in the Second World War a German reconnaissance plane crashed in a field near his home in Shotton and so he went on his tricycle to see what all the fuss was about. The pilot having survived the crash was sitting in his open cockpit and he handed Les a silver oval shaped medallion. His mother being quite naturally concerned about it, gave him a huge telling off, confiscated the medallion and threw it away. Perhaps someday we may find out who the pilot was and what his original mission was, but you can bet it was for a peep at the steel works. Then later on at the time of the cessation of hostilities in 1945 Les remember his father`s customers manhandling the pub piano into the street, in order to provide the accompaniment for the celebratory sing-song on VE Day. Les’ formal education began at King George Street Primary School which is still there and then he went on to attend Ruthin School as a boarder. For those who happen to make the trip to Ruthin, it’s the school just up the hill on the right on the way into the town. Because of its design it is now affectionately known as the ‘Hogwarts’ of Wales, but it really is a beautiful building set well back off the road and fronted by the cricket pitches. Pictured from left to right, are: Barry Jameson, Kevin Poynton, Les Smallman, John McIntyre and Andy Barton. In 1947 Les’ parents moved from Shotton to live in Widnes, and at about the same time Les left Ruthin and continued his education at Fairfield School in Widnes. At the age of 15 he left Fairfield School to start an apprenticeship at J Hemmings Motor Engineers in Hale Liverpool, earning no less than £1.15 shillings a week, which in today’s decimal currency equates to £1.75p. Les’ employer was obviously a descendant of Ebenezer Scrooge because when you asked could you attend college on day release he gave him permission but he deducted one days’ pay for each day attending, the princely sum of 7 shillings (35p) per day. Fortunately, after a great deal of effort and with the assistance of your Union Les was able to obtain employment with other employers as a draughtsman and went on to continue his studies at both Widnes and Warrington Technical Colleges until the age of 28. Then in 1962, reward for all the hard work and perseverance paid off when Les attained his Higher National Certificate. Kevin continued: “Your working life has certainly kept you busy and on the move! I understand that you have worked all around the country in such places as Luton, Bilston, Dumbarton and more locally, you worked at ICI Northwich, Ellesmere Port and for some time you were the project engineer for UK Construction in Kirkby. You eventually settled in Warrington and have lived in Woolston for some 38 years. In 1980 you joined British Nuclear Fuels at Risley and you stayed there until 1992 when you retired. I previously referred to your cricketing exploits or should I say lack of them, which leads me on to how you came to meet your future wife. You first met Pat at a dance hall in Manchester where she was apparently receiving far too much attention from a certain Charlie Griffiths, (now Sir Charles Christopher Griffiths) whom, some of us here this evening may recall, was one of the very fast West Indian bowlers who were the ‘scourge’ of the English batsmen at the time. You managed to sweep Pat off her feet and on 4 April 1964 you were married at St Mark’s Church, Pemberton, Wigan. You have now been married for 54 years. You have two children, Ian and Christine and three grandchildren. Apart from your Freemasonry you have enjoyed your hobbies of photography, gardening and golf, that’s when your creaking knees will allow. Your interest in Freemasonry was first instigated by the fact that both your father and your older brother Ronald were members of the Lodge of Equity No 1384 meeting in Widnes and on 5 December 1957 you were initiated into Freemasonry in that lodge at the tender age of 23 years. That lodge, like this one, was amalgamated and became the Lodge of Equity and Appleton No 1384. Owing to work commitments and the fact that you were living in Warrington you resigned your membership on the 31 December 1976. I did in fact contact the new secretary of Equity and Appleton Lodge to ask if I could have a copy of the minutes of that evening, but unfortunately due to logistical issues he was unable to assist but I will try again so that perhaps your secretary may be able to insert them into the minutes at a later date. You then joined Gilbert Greenall Lodge No 1250 on 14 February 1978. Your proposer as a joining member of Gilbert Greenall Lodge was David Evans, who coincidentally was the son of Evan Evans, who was initiated with you into the Lodge of Equity. You attained the Chair of King Solomon in the Gilbert Greenall Lodge in 1984 and you served as its tyler from 1996 until 2001 and then from 2004 until the amalgamation in 2006. The Province of West Lancashire acknowledged your service to Freemasonry and in May 1994, the Provincial Grand Master at that time, Kenneth Edward Moxley appointed you to the rank of Past Provincial Assistant Grand Director of Ceremonies. Shortly after joining the Gilbert Greenall Lodge you made the decision to become a Royal Arch Mason and you were exalted into Gilbert Greenall Chapter No 1250 on 2 December 1980, attaining the chair of first principal in 1990. Again, for your services to the chapter, the Grand Superintendent Kenneth Edward Moxley invested you with the rank of Past Provincial Assistant Grand Director of Ceremonies in the Royal Arch Province of West Lancashire in April 1997. 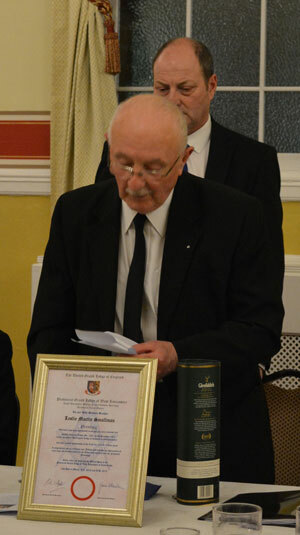 Les with his certificate and bottle of amber nectar responding to the toast to his health. Time certainly does fly brethren. It doesn’t seem like 10 years ago that many of you sat in lodge and were celebrating Les’ 50 years in Freemasonry, when Dennis Rudd was fortunate enough to be the presiding officer on that evening. I was with Dennis last week and asked him if he would be present this evening, unfortunately he was committed to another engagement which he could not undo, he does however send his hearty congratulations and wishes me to tell you that you don’t look a day older! Les, it is said that of all the pleasures a man can have, the greatest is to know that you are loved and because the brethren hold you in such high esteem and they are aware that you cannot always get to the hall on lodge nights it was decided at their meeting last December that you be made an honorary member of this lodge. In conclusion, Kevin said: “When you were initiated our Provincial Grand Master was Sir Knowles Edge, the Grand Master was The Earl of Scarborough. Today two Grand Masters and seven Provincial Grand Masters later, our present Provincial Grand Master James Anthony Harrison, to mark the celebration has caused to be produced a certificate to commemorate your diamond jubilee, which I would now ask our group chairman to read.” Andy Barton then read the certificate which Kevin then proudly presented to Les. John McIntyre then occupied the chair and closed the lodge. A fine banquet followed which included thick vegetable soup, roast lamb with mint sauce, with roast potatoes, fresh vegetables, crumble and custard followed with tea or coffee to finish. James Walker proposed the toast to the celebrant and provided some of the background information from his peers within the lodge. Les concluded by saying he had had a most enjoyable day and would remember it for many years to come, offering thanks to everyone for being there and sharing this delightful day with him. Following the meal an extra surprise awaited Les, in the form of a presentation made by the WM on behalf of the brethren of a bottle of amber nectar which Les was happy to receive. A raffle was conducted which generated a magnificent sum of £135. Nicholas Woodward brought the evening to a close by offering the tyler’s toast. Members of the Warrington Lodge of Concord in support of Les.